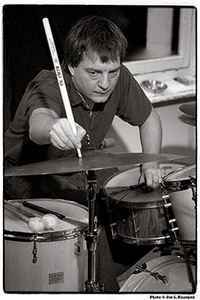 Drummer, bassist and recording engineer born at the 14th of July 1964 in Antwerpen (Belgium). He started to play drums at an age of 15 and he in 1975 he started his music study at the Academy of Antwerpen (Belgium). In 1984 he started to study with Jeff Hamilton in Los Angeles (CA, USA). After that he playes with lots of jazz artists and bands. Recently he started his own trio called Mother.